Eminem drops surprise album with homophobic slur. Twitter explodes. TBD: Is Tom Daley “Actually” Gay? WATCH: Is Eminem Trying To One-Up Frank Ocean’s Coming Out? 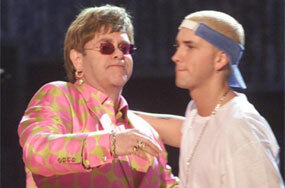 Has Elton John Ever Used Eminem’s Very Personal, Very Expensive Wedding Gift? Will Elton John + Lady Gaga’s Grammy Duet Mesh ‘Rocket Man’ With ‘Bad Romance’? 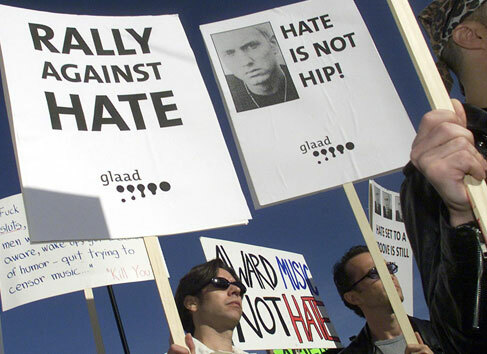 Eminem Just Agreed Not to Perform Anti-Gay Songs, And We’re Embracing Him. Why Not Buju Banton?